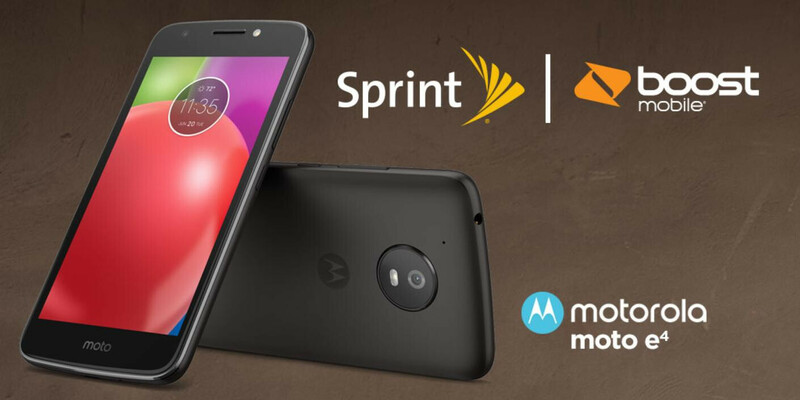 Starting today, Sprint and Boost Mobile are selling the Moto E4, one of Motorola's newest (and cheapest) smartphones. Previously released unlocked, as well as via Verizon and MetroPCS, the Moto E4 runs Android 7.1 Nougat out of the box, and is definitely a handset to consider if you're on a tight budget. While it's more expensive than on Verizon and MetroPCS, Sprint's and Boost's Moto E4 is still cheaper than the unlocked version of the phone, which costs $129.99. The handset can be purchased from Boost Mobile for $79.99 (plus tax) after instant online rebate, while Sprint customers can get it for $6.05 per month for 18 months. For a limited time (until September 14), well-qualified Sprint customers can lease any new smartphone and get up to 10 Moto E4 leases for free (at least one new line required). Powered by a Qualcomm Snapdragon 427 processor, the Motorola Moto E4 is splash-resistant, and sports a 5-inch 720p display. Other features include 5 MP and 8 MP cameras with flash (front and rear), 2 GB of RAM, 16 GB of storage space, microSD card support, and a 2800 mAh battery. If you want to buy the smartphone from Sprint or Boost, you can do it via the source links below. i didnt think it was possible but typical of sprint, they got themselves and boost a watered down version of the e4, why not give your customers the one with the fingerprint sensor. It has a different processor. That's why no scanner. But it picks up twice the frequency bands and the others. So the service is ALOT better then the others. They sacrifice scanner for killer reception. The Motorola Moto E4 (Boost Mobile Version) is an excellent device! I truly love it. The Battery Life is the Main Reason why I am into the device. I am a Power User. My cell phones get a ton of usage. At the end of the day, my battery still has some power to it. If I was not such a huge fan of the Moto E4's Battery Life, I would have gone back to the Samsung Galaxy J3 Emerge. I want to get the Moto E4 PLUS. However, I may wait and see if 2018 brings Moto E5 and Moto E5 PLUS. Before owning the Moto E4, I had not owned a Motorola Device since 2010. I never thought that I would ever purchase a Motorola Device again! I never thought that any phone brand could ever pry me away from Samsung and its Galaxy Devices! Well, Motorola has managed to do just that.